Improving the health status of employees is the goal of Cisco Systems in a 24,000 SF health center located on its campus. The focus is on creating a healthcare experience that employs leading-edge technologies comparable to the tools that employees use in their work. A wellness philosophy enables patients to manage their health, not just receive healthcare, and Cisco will be measuring improved biomedical risk factors and medical outcomes. 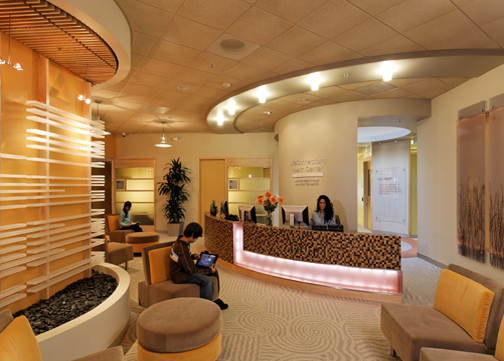 In this photo the “heart node” rotunda can be viewed beyond the reception desk (see description slide 3).